I've got Roxio Easy VHS to DVD 3 Plus installed, and have been recording video for more than a year with no problems. It still records video, with the audio, with no trouble. The problem comes when I want to record ONLY audio. Now that I'm trying to use Sound Editor to copy over my old cassettes, I can get no audio playback or recording whatsoever. I have tested the cassette player with headphones, and I get sound then, so the problem is not with the machine itself. I have tried making the Roxio line (USB input) the default device, I've maxed out the volume on the device, my computer, and inside the sound editor but I get only dead silence. The wavy sound lines also do not appear so it's clearly not getting any input at all. I have tested this on 2 separate laptops (Vista, and windows 8) to no effect. I tried an open-source audio recording program (Audible) but could not make the sound work there either. I have even tried using the VHS-DVD software to record it (though the video portion would obviously be blank) but there again I got no sound. I'm hoping someone can help me figure out what's going wrong here. There are very, very few programs that can work with the Roxio Capture USB, so not surprised Audible would not work. 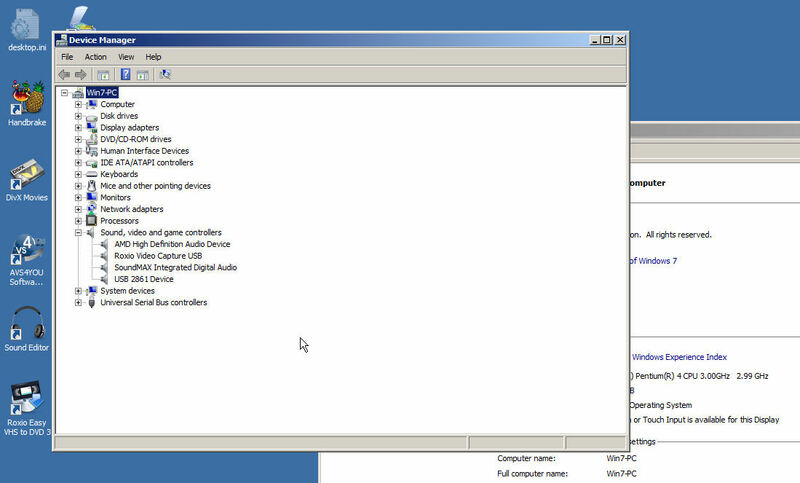 With the device plugged in, open Device Manager (Control Panel) and make sure you see both driver indicators in there! 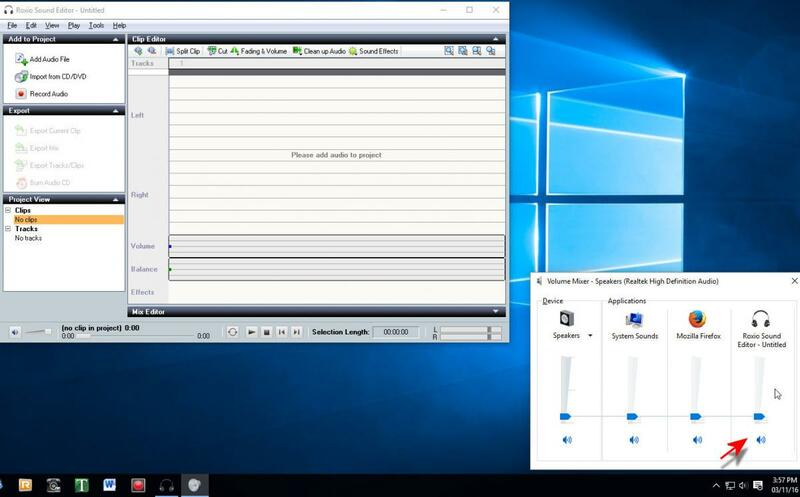 Also right click your Speaker and check the Volume Mixer to make sure Roxio is not muted. Please let us know what you find on both your PC's. I'm having the same exact problem. Do see the drivers and checked the speakers. No indications that anything is recording thou - just the timer goes on until I stop it. I am using a Sony stereo system, red and white cables (attached to the Roxio video capture USB) - and put that into the computer. Is that right? In post #2 the 2nd picture shows the Volume Mixer settings (on the far right). Does yours look the same?. Note: Jim's picture shows the volume is set to 0. If you capture VHS tape through the video application do you have sound? Yes, I have made a couple of DVDs from VHS tapes and that went fine. Thank you for replying. Your Sony stereo system red and white cables hooked to what, output? Computer. I'm trying to get music from stereo into the computer so I can make a DVD. Your Sony stereo system red and white cables have to be hooked to the output on the stereo system then go to the USB Capture device then plug that into you PC USB port. Is that the way your hooked up? Yes, that is what I am doing. Have to extend the cables but they are the same colors (It is one cable split into two on the ends, red & white). Have tried it with a CD and the tape player and just can't get any sound. The timer goes on but suppose that doesn't mean it is actually recording anything. Total length of this extended cable? I would get things closer together and use one cable about three foot in length. Tried to find a picture of what I'm using but no luck. Anyway, this cable is about 42" long and there is one white and one red connecting ends, cable goes together about six inches down from that and then it's the same on the other end. If this is the wrong cable to be using, then what do I need? You have to plug something into the Roxio capture piece to get from the computer to the stereo. If I only need one cable, what is that called? I'll look it up. Question, do you use this same 42" long cord when using the video application and you get sound? Good question but I couldn't answer you correctly without actually hooking things up and trying it. Haven't made anything off VHS in a long time so I really don't recall. Seems I used other cables thou. Am I wasting my time here? Well, the question I answered was about making a DVD off VHS and yes, that went fine. As for the cables I used, I'm not sure. I have a whole box of them. It's been over a year now. Now I am trying to get sound into the computer from the stereo and it's starting to look like I'm using the wrong cables. If you feel this is a waste of your time then I'd completely understand if you stop replying. The question was very clear "If you capture VHS tape through the video application do you have sound?" I wanted you to test it through the video app and see if you have sound using that cable. I can't poke your PC with a stick and find a fix for this if you don't trouble shoot and do what we ask! Just a quick question, do you have another device that could be connecting to the audio -- like a web cam? When I answered that it "went fine" I meant that I had both picture and sound when making a DVD off VHS. What I don't remember is if this is the same cable I was using - probably not. Best I can do is make another DVD and make note of the cables. I'll try that later today. No, nothing else is attached like a web cam. I think I'm using the wrong cables but don't know what kind of go buy. What player are you using to capture from? Where are you plugged into the player? Shorter cables are preferred but I'n not sure who could tell you the maximum length you can use. I'm trying to reload VHS to DVD 3 plus on my older laptop but with no success so far. I'm guessing blind. Go to page 23 and 24 in this getting started guide. Is this what you are doing? What player are you using to capture from? Where are you plugged into the player? I think I'm using the wrong cables but don't know what kind of go buy. This cable came with one of my Roxio devices. You can use one with two connectors instead of three just make sure the colors are connected correctly on your Sony and the Roxio capture device. I know it is a Sony stereo system but I don't know the model -- that is why I asked. It is NOT asked and answered and there is no information on which plugs are used on that stereo system. 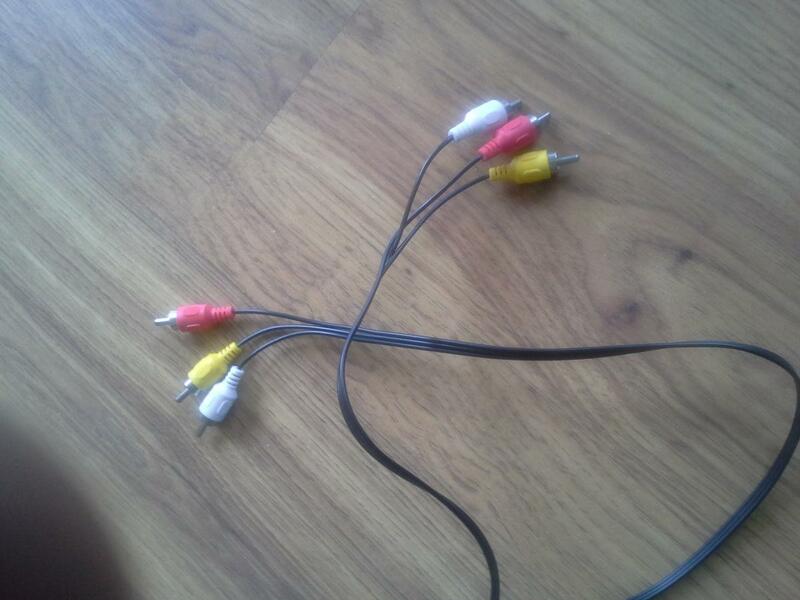 It's a Sony LBT-ZX661 (about 4 years old) and the plug ins are in the front - Says Audio, a white & a red.